DC Moore Gallery is pleased to present Joyce Kozloff: Maps + Patterns. This exhibition of new mixed media work synthesizes Kozloff’s interest in the meaning of maps with the forms of the Pattern and Decoration painting she pioneered in the 1970s. A catalogue featuring an interview with Kozloff accompanies the exhibition. Using these earlier pages as templates, Kozloff employed digital processes to reimagine the arrangement and scale of the patterns for her new work. She then infused these stunningly intricate paintings with collage elements comprised entirely of trial proofs from previous projects. Merging the biographical and the political, each panel becomes a microcosm of the artist’s career. In If I Were a Botanist: the Journey, patterns radiate and converge in constellations of brilliant color and interlocking shapes unfurling across some thirty feet of canvas. The maps in If I Were a Botanist: the Pale and If I Were a Botanist: Gaza invite comparison between today’s occupation of Palestine and the Pale of Settlement, the territory within Imperial Russia restricted for Jews from 1835-1917, to which Kozloff traces her ancestry. Throughout the 10 x 10 foot surface of The Tempest, Kozloff repopulates an 18th century Chinese world map with hundreds of excerpts from her previous work. Because she has long interrogated the implications of mapmaking in her art, Kozloff has collected and been given dozens of globe-themed tchotchkes. These tokens of friendship⎯as varied as earrings, ashtrays, erasers, napkin holders, piggy banks, key chains, paper weights and yoyos⎯are halved and affixed to the panels. Art historical imagery featuring the famous cartographers of the Renaissance, who “explain things” while pointing to globes, share space with the superhero Captain Planet and military figures including Joan of Arc and Napoleon. The Tempest conflates eastern and western systems for representing the world with ancient, early modern, and contemporary attempts to understand, navigate, and use it.Joyce Kozloff: Social Studies, an exhibition of mixed media works based on vintage French schoolroom maps, will be on view concurrently at the French Institute Alliance Française, 22 East 60th Street, NYC, from February 25 through April 25. 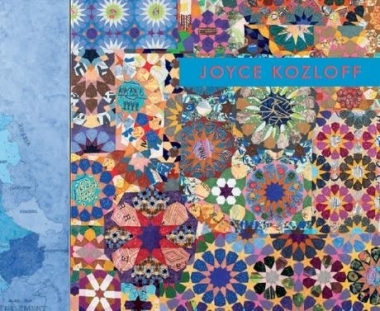 Joyce Kozloff earned her MFA from Columbia University in 1967. She has been an activist in the feminist art movement since 1970. After a sustained commitment to public art throughout the 1980s and 1990s, she returned to a studio practice that encompasses painting, sculpture, installations, printmaking, and photography. Her work is included in public collections such as the Brooklyn Museum of Art, NY; Los Angeles County Museum of Art, CA; Metropolitan Museum of Art, New York; Museum of Modern Art, New York; National Gallery of Art, Washington, D.C.; and Whitney Museum of American Art, New York. The Brooklyn Rail: "Joyce Kozloff"
Hyperallergic.com: "Joyce Kozloff: Contradictory Patterns & Decorative Illusions"
Artnet: "Joyce Kozloff in 20 Most Memorable New York Gallery Shows of the Year"
Artcritical: "Jack Hartnell on Joyce Kozloff"